Sustainable Design through Process Integration: Fundamentals and Applications to Industrial Pollution Prevention, Resource Conservation, and Profitability Enhancement, Second Edition, is an important textbook that provides authoritative, comprehensive, and easy-to-follow coverage of the fundamental concepts and practical techniques on the use of process integration to maximize the efficiency and sustainability of industrial processes. The book is ideal for adoption in process design and sustainability courses. It is also a valuable guidebook to process, chemical, and environmental engineers who need to improve the design, operation, performance, and sustainability of industrial plants. The book covers pressing and high growth topics, including benchmarking process performance, identifying root causes of problems and opportunities for improvement, designing integrated solutions, enhancing profitability, conserving natural resources, and preventing pollution. 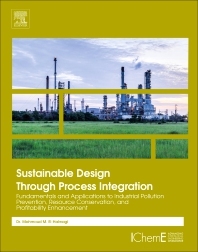 Written by one of the world’s foremost authorities on integrated process design and sustainability, the new edition contains new chapters and updated materials on various aspects of process integration and sustainable design. The new edition is also packed with numerous new examples and industrial applications.